I am certain that everyone is sick of hearing complaints about the weather these days, but holy guacamoli…please mother nature, MAKE UP YOUR DAMN MIND ALREADY! On Thursday of last week, they were calling for sun and 26 degrees for the weekend. Needless to say, we did not get our nice sunny pool weather. Nope, we got muggy, dark, torrential down pours which was not fun. The twinados aren’t old enough to enjoy a veg-on-the-couch-eating-cheesies day, so a Netflix binge was out of the question. Whats a momma to do? The kids have been coming home with a new craft weekly from daycare and really seem to enjoy them. Every morning Lincoln looks at his wall and tells me about his hand print crab or tissue paper tree. I love this stage where everything is fascinating and simple crafts delight them. After lunch, Alain was able to distract them long enough for me to make a pom-pom slide from toilet paper rolls and a bit of masking tape. This one was a total win. Lincoln was still running around collecting rogue pom-poms right up until bedtime. We switched the cardboard tubes around several different ways trying to make a better slide each time. Mommy has a legal background, I’m not an engineer, so it took a few tries before the poms would even make it into the bucket on the floor. But we got there! Daddy is working tonight and the kiddos are in bed. Now its mommy’s turn for a rainy day craft; nutella brownies! Nom nom! Our Journey to 7pm Bedtime. Our first two years with the kids was pretty amazing. We were feeling very fortunate to have good eaters, good sleepers and overall happy babies. They were both pretty independent and preferred to sleep alone in their cribs rather than in our bed. They’ve always adjusted well to changes in their routine, transitioned smoothly into a new house and have no allergies/medical issues to speak of. In November we began phasing out their bottles and replacing with water and sippy cups. By January, the bottles were gone and they didn’t even seem to care. In February, I was heading up to my dads for a week and thought it would be the perfect time to drop the soothers. In hindsight, it worked well. But in those wee hours of the night when my brain was turning to mush, it was hell. I “forgot” the soothers at home and heard a few extra cries because of it, but I knew it was only temporary. Little did I realize that all of the extra rocking and cuddling they had received had actually replaced the security they felt with the soothers. When we got back home, things were okay. Al was working a lot of nights, but I managed to find a routine. By 8pm, the kids would be in pajamas and vegging on the couch watching some hypnotic lullaby show. Usually, Lincoln would stumble over and want to cuddle within ten or fifteen minutes. I could sing him a few songs and he would pass out in my arms, making it easy to put him in his crib and call it a night. My little night owl Brooklynn, would be up until about 9:30 before finally giving in and wanting her song and a cuddle. By 11pm, I was happy that both kids were in their beds. That was a success, no? A three-hour bedtime routine wasn’t too bad as long as we were avoiding meltdowns. 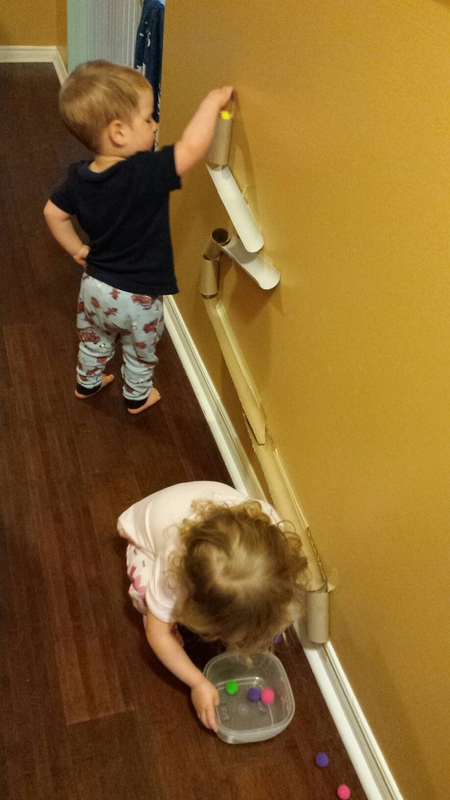 Our routine lasted about a week before the teething got worse and the bedtimes started to collide. Both kids were beyond tired and began fighting for my attention. I would spend two to three hours switching between kids trying helplessly to get one to finally fall asleep. Al often came home around midnight to find me in tears, overrun by toddlers and frustrated as hell. I juggled and fought with the kids, trying everything I could think of to get them to bed but nothing was working. Brooklynn became very clingy and was terrified when I left the room. I can remember waking up every 20 minutes to her screaming in sheer panic when I wasn’t in her room. I spent many nights asleep on her floor with my arm in her crib, praying for a solid night of sleep. I think Lincoln was starting to feel abandoned because out of nowhere, he refused to sleep alone. At one point, I even set up pillows on his floor trying to convince him that I was still in his room, but he didn’t fall for it. At my wit’s end, I gave in and brought Linc’s crib into Brooke’s room hoping that if I lay between them, we might all get some sleep. It didn’t happen. They both screamed and kicked and refused to sleep unless they were in my arms. Thats when I broke. I had enough. I tried being nice, I tried to be accommodating and I tried to keep calm. Nothing was working. I was getting angry. I didn’t like my kids, and I hated myself. I hated the sound of their whiny little voices and hated the screech of their cries. I hated life. I needed to sleep and these little monsters weren’t letting me. What happened to my perfect little babies? One more night of fighting and I was bound to hit someone. Not because I wanted to, not because I had to, but because I was fueled by emotion and exhaustion and I needed an outlet. I spoke with friends and even asked my doctor for help, and he said “crying it out won’t work, you just have to get through it”. Unbelievably helpful! You don’t just get through it with twins. You need a plan. Control the chaos or lose your mind. I turned to a group of strangers for help. Other moms of multiples who truly understand what it is like to be in my exact shoes, feeling completely depleted and helpless. I swallowed my pride and begged for support and guidance. The response was immediate. I was overwhelmed with support and so many “I’ve totally been there girl!’s that I started to cry. Everyone gave me real world advise, not what the books say. They gave me timelines, tips and even told me what not to do. But more importantly, they made darn sure I knew that I wasn’t alone. There was help, just a Facebook page away, and each one of them have survived this phase in motherhood. It was the most humbling and encouraging moment I think I have had. The best piece of advice I can give, is to make sure that you and your spouse are on the same page. Be 1000 percent sure you agree and are ready to support each other. There will be times when the crying is too much or you second guess your decisions, but don’t. Don’t give in to the pressures from other people or made up fears some internet fob stuffed in your brain. This is YOUR family, YOUR kids and YOUR sanity. You do what works, and nothing else. Have a plan, agree on it, and stick to it. Our new plan started at 6:30pm. TV off, pajamas on and quiet time. 6:45 – snack then brush teeth. 7pm – Sit on Linc’s floor and read two stories and then sing two songs. We chose ABC’s and Twinkle Twinkle Little Star because they have the same melody. We still sing these same two songs every night, no exceptions. Hugs and kisses, then into bed. We have dark curtains, a dim nightlight and music in their rooms and sippy cups of water in their cribs. We lay them down, say “I love you, time for night night” and walk out. We did 20 minute checks for the first hour, and then 30 minute checks until they were asleep. Keep your cool. The kids will feed off your energy. Save the rage and tears for the bathroom floor. When you go into to check on them, be calm, quiet and efficient. Don’t linger. Assure them that you are there, that you love them and remind them that it is time for bed. Walk away. Even if they are standing up screaming, walk away. Go eat a pint of ice cream and sob in the bathroom for 19 mins, then check again. Brooklynn cried for two hours every night for nearly two weeks. But she stopped. She doesn’t cry anymore. She sleeps soundly for twelve hours and it’s amazing. Crying WILL NOT hurt your child. Yes, their eyes may get puffy, they might throw up, their voice scratchy and face blotchy, but it is all temporary. This too shall pass. Clean ’em up, wipe ’em off and back to bed. The older the children are, the harder it is. My kids just turned two when we started. I wish now that we started at nine months. At two, they are smart. They know how long they need to cry, and how loud, before mommy or daddy will come get them. Don’t let them win! If you let them cry for two hours and then cave, the next night you can be sure they will cry for two hours and one minute because they know you will cave again. They are testing your limits. You are the parent, you set the rules. We have to be the ones to teach our kids how to behave. Screaming their faces off for hours on end can not result in the desired behavior or no one wins long-term. If your heart breaks, its okay. Sleep training does not feel good and it will probably make you question everything you have ever done, but that just shows how much you truly care. In the end, the kids will sleep better and will be happier during the day. You will get your evenings back and be better rested. You will enjoy being with your kids again and will embrace the fun times. I knew that we had to make this change. I kept telling myself, that its better for them to lose their voice rather than their life. Now, it may not get that bad for everyone before you decide to sleep train, but this feisty red-head has a temper just like her father and I knew I could only hang on for so long. If you are struggling, reach out for help. Find friends or even strangers who are in your same situation. People who can truly relate to your struggle and lean on them. The moms of multiple groups help me, but maybe you have a child with special needs, or are a single parent with no support. We all have a story, but finding support from those who best understand your unique situation is extremely beneficial. Sleep training worked for our family and I am a much better mom because of it. Hey Y'all! I'm Danielle. I am married to my best friend and together, we are navigating our way through life with twins! We laugh A LOT, cry a little and love unconditionally. Never want to miss a post? Click here to add your email and get notifications directly to your inbox!